Pitched as a limited series, it opened with Juggy deciding to lay low a bit, taking up residence in an apartment building in a somewhat run-down section of New York City. The basic storyline had him getting involved with the Kingpin (which of course would've brought Spidey and Daredevil into the mix), being betrayed by the Kingpin and Juggy determined to bring him down in revenge. 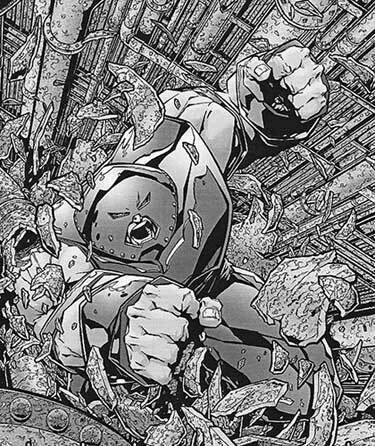 Juggernaut is one of the few villains (or was; is he still trying to reform in the current Marvel U?) who could work in his own title. He isn't malevolent, or trying to conquer the world. Sure he has brother-issues that get out of hand, but he just lives life his way and the hell with anyone who disagrees. We thought we could find a sort of internal value system to him, like loyalty to friends, etc. Not that we intended to white-wash him; he would've definitely done some "bad" things in the series. We were also going to explore the perception of hero/villain. One example of this was a story where a hero tracks Juggy back to his apartment and tries to apprehend him. Only problem is the neighbors turn against the hero; for the first time in years, the neighborhood has been getting better because of Juggy's presence. Drug dealers and the gangs have cleared off the block, etc. To the neighbors, Juggy's their hero. Late at night, a drug deal is going down in front of the building. A badly hurting junkie is scoring off a couple dealers. Suddenly Juggy is there and scares off the dealers emphatically. The junkie suddenly has a hopeful gleam in his eye; he thanks Juggy, saying no one's cared about him in years. Juggy's response: "I don't give a #%@% about ya, ya %$#@ing addict. You wanna kill your self, fine by me. Just do it on someone else's $%#@ing block."